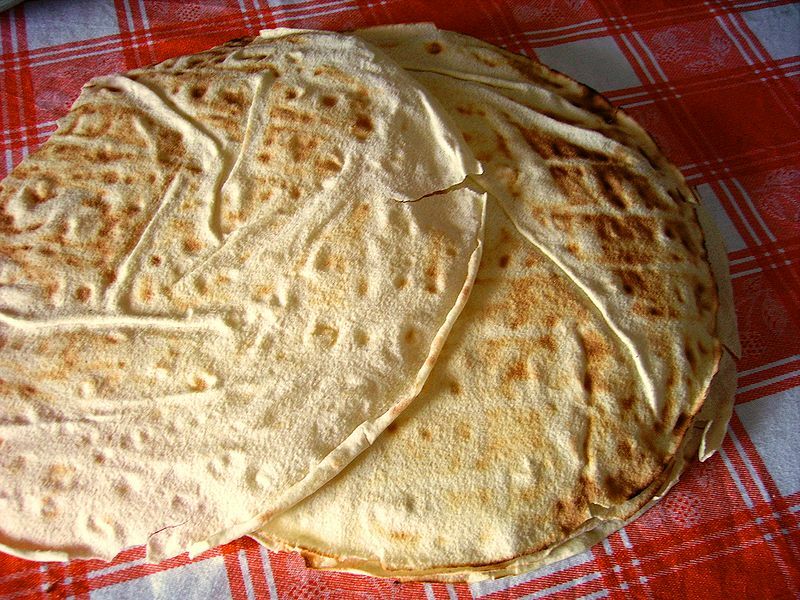 Pane carasau, or carta da musica, is a traditional flatbread from Sardinia. It is thin and crisp, usually in the form of a dish half a meter wide. It is made by taking baked flat bread, then separating it into two sheets which are baked again. Left: Pane Carasau, tipical bread of Sardinia, Italy. The recipe is very ancient and was conceived for shepherds, who used to stay far from home for months at a time. Pane carasau can last up to one year if it is kept dry. The bread can be eaten either dry or wet (with water, wine, or sauces). It is called carta da musica in Italian, meaning sheet music, in reference to its large and paper thin shape. Combine the two flours with about a teaspoon of salt. In a small cup, dissolve the yeast in about 1/4 cup of the warm water. Let sit until bubbly. Add the yeast mixture to the flour with the rest of the water. Mix until you have a smooth dough. Cover and let sit 1 hour. Knead for 5 minutes and cover for another hour. Preheat the oven to 475 degrees F. Spray two flat baking sheets with oil spray. Knead the dough once more and divide into 8 equal balls. Roll each ball out as thinly as you can to fit the baking sheets, and bake each for 5 minutes in the preheated oven. The breads should blister but not yet brown. Remove from the oven and pile one on top of the other. Place a board or flat tray on top and let sit until cool. To prepare for serving, return each bread to the oven for 10 minutes or until golden and crispy. Remove, brush lightly with olive oil, sprinkle with fresh chopped rosemary and salt and return to the oven for a few minutes. Serve warm.